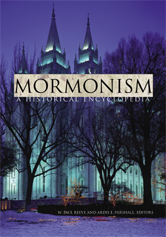 Editors: Reeve, W. Paul and Parshall, Ardis E.
The encyclopedia begins with an overview of The Church of Jesus Christ of Latter-day Saintssix essays cover the church's history from Joseph Smith's first vision in 1820 to its current global status. This provides a context for subsequent sections of alphabetically organized entries on key events and key figures in Mormon history. A final section looks at important issues such as the church's organization and government, its teachings on family, Mormonism and blacks, Mormonism and women, and Mormonism and Native Americans. Includes biographical sketches, chronology, and bibliography.